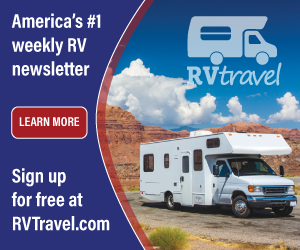 Harry, if you’ve ever attended one of my seminars, you know I’m a big proponent of keeping moisture, dirt and grime from accumulating on RV tires as well as preserving and protecting them from ozone and the UV rays of the sun during periods of non-use. Sure, they’ll get dirty while traveling, but be sure to wash them with a mild detergent the soonest you can after coming off the road. Applying a protectant such as 303 to help preserve and protect the rubber will also go a long way. Not so much on concrete, but when parked on asphalt, it’s advisable to have a barrier between the tires and the surface of the asphalt. 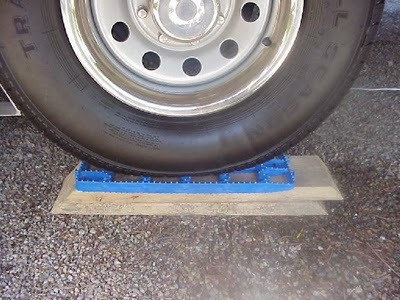 Though wooden blocking is often used to separate the tires from the asphalt as well as to lift that corner of the motorhome, I also favor a separation between the wooden blocks and the tires to avoid excessive moisture and/or heat build-up. Plastic, web-like blocks are readily available in the aftermarket that allows you to accomplish this. The accompanying photo shows such a separating block. There are many on the market, but look for the type that will drain and not trap moisture.